In 1991, the Canadian Government decided to close its Trade Office in Denver. 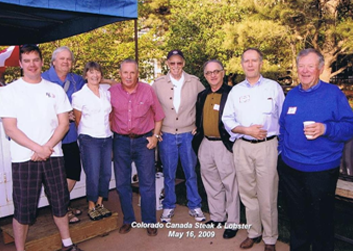 A group of resident businessmen, prompted, encouraged and supported by the departing Canadian Consul and Trade Commissioner, Gib McEwen, decided to form an organization to promote, foster and enhance business relations between Colorado and Canada. In his Trade Office position, Gib had made numerous contacts with Canadian business people, residents, trading partners and interests. To determine what benefits might be found by creating a point of contact for Canadians, a notice was placed in the local newspapers for an introductory meeting. That meeting was held at the Denver Athletic Club in October 1991 and was attended by well over 50 people – thus began our history. The early years focused on business-related activities such as seminars to discuss cross-border investment opportunities, tax implications, economic and trade issues. Several social events were also held; notably to celebrate Canada Day, Canadian Thanksgiving and the Grey Cup football playoff. Initially, the group was called Colorado Canada Business Association. 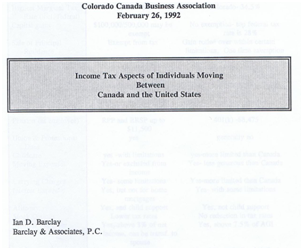 In 1992, Ian Barclay presented a seminar on February 26 to discuss Income Tax Aspects of Individuals Moving Between Canada and the United States. At the same time, Bruce Lemons from Holme Roberts and Owen spoke about U.S. and Canada Cross-Border Estate Tax Planning. The Canada Day Picnic was held at Butterfield Crossing Park in Castle Rock on July 1st. In 1993, the Canada Day Picnic was held in' Washington Park on July 1st. Foot races, tennis, horseshoes, croquet, and volleyball helped a large gathering of families build appetites for chicken, beef, hot dogs, salads, cake, watermelon, and drinks (even beer!). Pat Coulson was the main organizer. 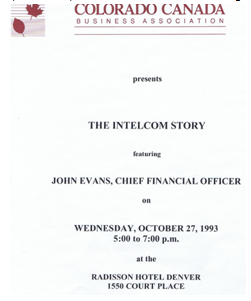 John Evans of IntelCom Group talked about Building Information Superhighways on October 27.
past events, and to acquaint everyone with what is going on up north.” Gerry Kesner and Dee Arscott were the initial editors, gathering and typesetting data and producing the document. Dee designed the masthead, general layout and named the paper. The masthead was the germination of what ultimately became the official logo for the Association (maple leaf and aspen leaf). 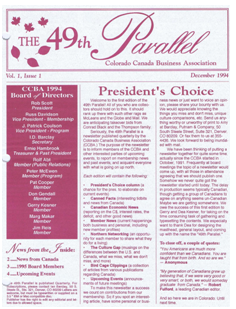 In 1995, during the March meeting the Board decided to change the name of the group to Canada Colorado Association (CCA). Lloyd Brownlee and Patrick Coulson put together a gathering of wannabe cowboys for dinner and rodeo at the National Western Stock Show and Rodeo in January. General Dave O’Blenis from NORAD joined the festivities with his wife Loreen. Lloyd also organized a group of 70 members to see the Denver Grizzlies meet the Milwaukee Admirals for a rousing game of hockey at McNichols Arena on February 8. A locker room tour, autographs and mementos were included in the $13.00 price! Member Ken Turnbull hosted over 110 people for the Canada Day picnic on July 1st at Struthious Farm in Highlands Ranch – where Ken bred ostriches. July 5 was a special day for all hockey fans in Colorado when the Avalanche were introduced as the new NHL team – relocated from Quebec City. With arrangements through Rolf Abt, CCA members were invited to hear former Prime Minister Brian Mulroney speak to the Colorado Harvard Business School on October 17. On October 30, CCA hosted a luncheon to celebrate the inauguration of direct flight service with Air Canada to Vancouver, Calgary and Toronto. The Grey Cup Party was held on November 19 at Fiore’s Restaurant. A very special arrangement was made to tour the NORAD facilities in Cheyenne Mountain on March 25. 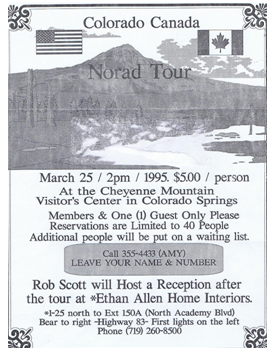 Rob Scott held a reception afterwards at his Ethan Allen Home Interiors store in Colorado Springs. In 1996 events started with Canada Night at the Stock Show and Rodeo on January 14. CCA sponsored specially priced tickets to see the Colorado Avalanche meet the Edmonton Oilers on March 17 at McNichols Arena. Unfortunately, the Canada Day celebration had to be cancelled this year because of insufficient response. Brock West, Member at Large. In 1997 the Board again remained essentially unchanged. Canada Night at the Stock Show and Rodeo was held on January 19. There were some problems with getting The 49th Parallel issued so news was sparse through the year. The Grey Cup Party was held at the (then) Marriott Hotel at Hampden and I-25 on November 16. Don and Lynn Harper hosted a charity food drive at their home on Boxing Day. aspenleaf pattern from the CCA logo. Canada Night at the Stock Show and Rodeo was held on January 18. On April 16, Robert Déry, Consul General of Canada in Minneapolis held a reception at the Western Social Sciences Association Conference. Thanksgiving was held on October 11 at the Great West Life cafeteria – once again a pot-luck style event. Lloyd Brownlee organized the Grey Cup Party on November 22 at Fiore’s Restaurant. Garth Wilson, Member at Large. In 1999 the Canada Day Stock Show dinner and Rodeo was held on January 17. Ian Barclay, with Wayne Robinson, Consul and Senior Trade Commissioner from Minneapolis, organized a presentation at the World Trade Center on March 22 during which KPMG representative Stuart MacKay and local businessman, Jeff Jensen, discussed Canada: The Competitive Alternative. A Steak and Lobster barbecue was held at the Al and Fran Troppmann residence on May 22. Through the determined efforts of Brock West, renewed contact was made with NORAD’s Deputy Commander from Canada, Lt. General George Macdonald. 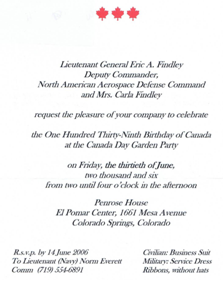 Those efforts were rewarded in an invitation for the Board members to join NORAD personnel at their Garden Party at the historic Penrose House in Colorado Springs on Canada Day. NORAD alsohosted a second tour of Cheyenne Mountain on September 17. A barbecue was hosted afterwards by the 971 Air Marshall Slemon Wing Air Force Association of Canada at Peterson Air Base. Denver Mayor Wellington Webb invited CCA members to a July 7 dinner celebration of the inaugural Air-BC flight between Winnipeg and Denver. 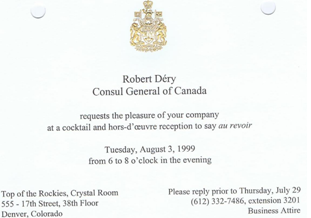 On August 3, Robert Déry held a reception at the Top of the Rockies to formally announce his departure as Consul General in Minneapolis. He was reassigned to Ottawa and was replaced by Susan Thompson, former Mayor of Winnipeg. Rolf Abt did his usual super job of organizing Canadian Thanksgiving pot-luck dinner at Great West Life on October 10. The Grey Cup Party was held again at Fiore’s on November 28. CCA contributed to and supported the Institute of International Education (IIE) for the International Holiday Party on December 9. Don and Lynn Harper hosted another open house on Boxing Day, December 26. 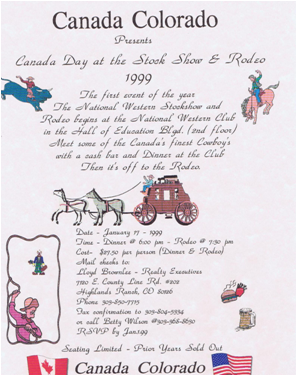 In 2000 the Stock Show and Rodeo dinner was held on January 16 and we were honored that Lieutenant-General and Mrs. Macdonald from NORAD joined our group, which including 5 Canadian cowboys and 50 guests. On January 23, the Macdonald’s reciprocated with an open house at their home in Colorado Springs. Ian Barclay organized a panel discussion on February 10 to have Joe Green discuss immigration and naturalization issues. Some of the CCA members attended an Inuit Art Show on March 13 at the Native American Trading Company Gallery which was owned by Canadian Jim Ellerton. The opening was attended by Colorado’s First Lady, Frances Owen, Lt. General Macdonald, First Lady of Denver, Wilma Webb and Canadian Consul General Susan Thompson in Minneapolis. CCA co-sponsored a luncheon meeting at the Hyatt Regency Hotel on March 27 to hear Hon. Gordon Griffin, US Ambassador to Canada and Hon. Jeffrey Davidow, US Ambassador to Mexico discuss North America in the New Millennium: the View from Our Neighbors. A reception was co-sponsored on May 10 at the Adam’s Mark Hotel to recognize World Trade Day. 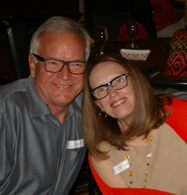 The annual Steak and Lobster dinner, hosted by Al and Fran Troppmann, was held on May 21st. Lloyd Brownlee brought his cook wagon trailer and $300 was raised for SIDS charity. Marion and Wally Clark struggled with but enjoyed the lobster – pictured to the right. Canada Day was celebrated o n July 1st at the Gun Club Green Clubhouse, hosted by Garth and Betty Wilson. See the group picture on the left. NORAD held a dinner on August 28 at Peterson Air Base in Colorado Springs, hosted by Lt. General Macdonald for Canadian business leaders at which CCA was represented by Garth Wilson. The Association again supported the International Holiday party on October 6. Rolf Abt was again the leading force behind the Canadian Thanksgiving pot-luck dinner at Grea8t West Life on October 8. He and his family and friends are pictured at the left. 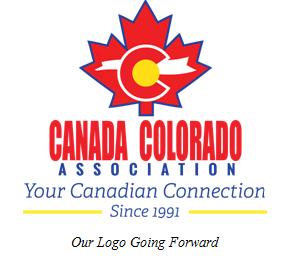 Throughout its history, CCA made extensive lobbying efforts in the process of getting the Canadian Government to re-establish a Consular presence in Denver. As part of that effort, we spoke, met and corresponded with Consul General Robert Dery, Consul and Senior Trade Commissioner, Valerie Smith and Business Development Officer, Dana Boyle from Minneapolis, and local business connections. An initial step was to organize a private viewing of the Canadian Native Art Exhibition HuupuKwanum-Tupaat, Treasures of the Nuu-chah-nulth Chiefs. The viewing on October 30 was made possible through the generosity of PCL Construction Enterprises, CCA, Mile High Realty Executives and the Denver Museum of Nature and Science. A luncheon was also held on October 31 to introduce and hear Frank Clayton, Secretary of the Treasury Board & Controller General of Canada and Valerie Smith, Consul and Senior Trade Commissioner. 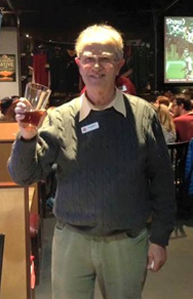 Lloyd Brownlee was the leading force for the Grey Cup Party that was held at Jackson’s DTC on November 26. BC battled Montreal to a close win for the enjoyment of 53 members. Some great prizes and awards were handed out. Garth Wilson, Treasurer and Membership. In 2001 CCA member John Murphy designed and constructed a website for the Association: www.canadacolorado.com. Board member Alex Burney took over maintenance and operation of the website. 55 members went to the Stock Show dinner on January 14 including Lt. Gen Macdonald who rode the stagecoach at the start of the Rodeo. Several members also took part in the International Business and Rodeo Day sponsored by the World Trade Center on January 16. On April 19, pictured right - Al Troppmann, Garth Wilson and Ian were interviewed by Catherine Cano, Producer for the CBC French Television Network to report on the social and business roles of CCA in Denver. The Victoria Day Steak and Lobster dinner was held on May 19 at the home of Fran and Al Troppmann – pictured below with Lloyd Brownlee who did his usual masterful job on the barbecue. 61 people attended and more than $550 was raised for SIDS. Jim Brooke, CCA member and New York Times correspondent for Canada, gave a talk on June 21 at the Denver Athletic Club relating his experiences and Canadian anecdotes. Troppmann, Glenn Ardley and Ian poked a little fun at “Newfies” in the picture on the right. Great food, much fun and family enjoyment were experienced by the 61 people on a perfect afternoon. Valerie Smith and John Lambert from the Canadian Consular office in Minneapolis attended the picnic too. Before the CCA picnic, a reception was held at NORAD in Colorado Springs where the transition to replace Lt. Gen. Macdonald with Lt. Gen. Ken Pennie was made. September 11 brought discord to the lives of most people in the world – primarily Americans but also Canadians and others. CCA expressed its support in many ways including making several hundred t-shirts with the flags of the two nations and United We Stand printed on the front. Proceeds from the sale were distributed to deserving charities and several shirts were sent to soldiers who were recovering from their wounds. Canadian Consul General from Minneapolis, Susan Thompson, accepted our invitation to give an address to CCA members on September 27 on Canadians’ Response to Terrorism. Ian and Lloyd arranged the details for the discussion at the Denver Athletic Club. Canadian Thanksgiving was celebrated by 54 people at Heather Ridge Country Club on October 7. Glenn Ardley coordinated efforts for a scotch tasting evening on November 3rd sponsored by his Queen’s University Alumni Association. A few of the Board attended a reception on November 5 for discussions with representatives from the Saskatchewan Trade & Export Partnership. The Grey Cup Party was held at Boston’s Gourmet Pizza on November 25. Boston’s owners, Ron and Tracy Brodeur were terrific hosts and great food and drink was enjoyed by all. Boston’s purchased a special satellite feed of the game which was arranged for and set up by Alex Burney. The record 140 attendees watched Calgary defeat Winnipeg 27 to 19. Many great prizes were donated and distributed to the lucky folks. CCA again co-sponsored the International Holiday Party at the new Denver Library on December 6th. In 2002 Member Bruce McQuat of IKON Office Solutions generously donated resources and staff for copying the Newsletter. A sell-out with 80 people participated in the January 20 dinner at the Stock Show and 67 stayed on for the Rodeo. Lt. Gen. Pennie and his wife, Lise, represented Canada in the stagecoach ride at the Rodeo. On March 23, under the able guidance of CCA member Fred Fleming (Special Assistant to Pat Bolen), 31 members toured the Bronco Team Headquarters, and then enjoyed lunch at Earl’s (Canadian) Restaurant. In the continuing effort to have Consular representation re-established in Denver, several meetings were held: April 10 with representatives of Governor Owens; April 24 with representatives from Mayor Webb and World Trade Center; May 7 with the Canadian Chamber of Commerce representatives; and June 11 with Consul General Susan Thompson and Public Affairs Manager Gerry Foley from Minneapolis. On August 1st, Susan Thompson was replaced as Consul General in Minneapolis by Christopher Thomson. Meetings were also held with the British Consul in Denver, John Maguire; British American Business Council President, Carolyn Andrews; Mexican Consul in Denver, Leticia Calzaba; and Deputy Consul General from Minneapolis, Roman Borowyk, all with the objective of re-establishing a Canadian Consul in Denver. Al and Fran Troppmann again hosted the Victoria Day Steak and Lobster dinner for 86 members and guests on May 18 - assisted by Lloyd Brownlee and Dale Fraser as cooks. $1,775 was raised for the SIDS Charity. Our own Canada Day picnic was held on June 30, once again at Willow Way Park with over 80 participants in the fun and games. Members Bret and Karen Schihl donated a Canadian Flag to the Association. 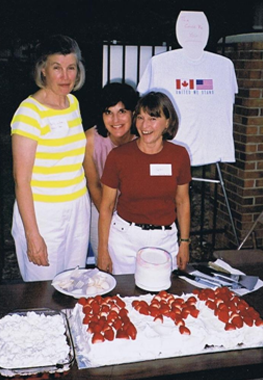 Pictured at the right, Betty Wilson, Catherine Cano and Fran Troppmann helped cut and distribute the Canadian flag cake that Fran had made. The special “United We Stand” tee-shirt made by CCA in recognition of 9/11/01 is on display behind them. A few Board members were pleased to attend the NORAD-hosted celebration of July 1st at Penrose House in Colorado Springs. The firm CAE (Canadian Aviation Electronics, Ltd) opened its flight simulator aviation training facility (built by PCL) in Denver. A grand opening ceremony on September 17 was attended by many CCA members as well as the President and CEO of CAE, Derek Burney, PCL President Al Troppmann and Denver Mayor Webb. Rides in the Airbus A320 and Bombardier simulators were enjoyed. General Manager Michael Fedele and his wife Daniele joined and became strong supporters of CCA. Lloyd Brownlee, Brock West and Don Harper attended the change of command at the US Northern Command at Peterson Air Base in Colorado Springs on October 1st, hosted by General Ralph Eberhart. A breakfast presentation by Denver Mayor Webb and meeting with representatives from several international airlines was held on October 4 to discuss service expansion at DIA. Canadian Thanksgiving was celebrated at Heather Ridge Golf Club on October 13 with 76 members and guests. World renowned Canadian artist, Robert Bateman hosted an exhibit of his work from November 9 to January 3, 2003 at The Wildlife Experience Museum. He was very gracious in talking about his paintings and autographing books. Montreal defeated Edmonton 18 to 16 to win the Grey Cup – cheered on by 130 members and guests at Boston’s Gourmet Pizza on November 24. The International Holiday Party, co-sponsored by CCA, was held on December 11, again at the Denver Public Library. 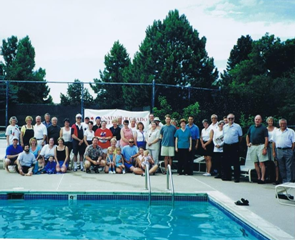 In 2003 the CCA year started with a special event on January 11, 2003 when several members of the Canada Colorado Board were invited to the home of Lieutenant-General Ken Pennie for an “Afterglow” open house. Ken and Lise were their usual superb hosts and we made good use of the opportunity to renew old friendships and meet new people, including those associated with NORAD. Our usual January event, Canada Day at the Stock Show and Rodeo, was another great success on the 19th of the month. We were honored to have Consul General Christopher Thomson and his wife Katrina as our guests from Minneapolis. Consul and Senior Trade Commissioner Aladin Legault accompanied the Thompson’s and was quickly transformed into a Colorado cowboy – complete with black hat. We were doubly honored to have Brigadier General Jim Hunter join our group and were pleased that both Chris and Jim rode in the Denver Post stagecoach to the introduction ceremony and national anthems. We had our best turnout ever for this event with 80 people at the buffet and 95 at the rodeo. Some were heard to say it was the best rodeo they have seen. On the morning of January 20, 40 people attended a breakfast presentation at the Pinnacle Club when Chris Thomson discussed trade relations between Canada and Colorado. The guest list at the event included executives from many prominent firms in the Denver area with a Canada connection, plus Governor Owens’ Office of International Trade and Mayor Webb’s Office of Economic Development. In addition, NORAD was well represented by Major Peter Dozois and his wife Angela. On February 25, several Association members attended a presentation by a group from the Federation of Canadian Municipalities in connection with the softwood lumber issue. Members of the Governor’s and Mayor’s offices as well as Consul General Chris Thomson attended the meeting. On May 17, fifty-four guests attended the annual steak & lobster dinner in support of the Sudden Infant Death Syndrome (SIDS) charity. Fran and Al Troppmann were hosts. Through some extra efforts by CCA Board members Lloyd Brownlee, Catherine Cano, Garth Wilson and Brock West, arrangements were made for a delegation from Ottawa to visit several businesses, attend meetings with key people and see the attractions in Denver relative to the possibility of re-establishing a Consular office here. Laurel Alpert of Governor Owens’ office, Julie Rubin of Mayor Webb’s office, Jim Reis from the World Trade Center, and Chad DeLong from the Denver Metro Chamber of Commerce also made terrific contributions to the arrangements. The plans culminated in the CCA co-hosting a team of 6 representatives from Ottawa, two of whom were here to look at potential locations for offices and residences, plus Consul General Chris Thomson and Deputy CG and Senior Trade Commissioner Roman Borowyk from the Canadian Consulate office in Minneapolis. On June 25, through the efforts of the World Trade Center, CCA co-hosted Colorado International Soccer Night at Invesco Field at Mile High Stadium. 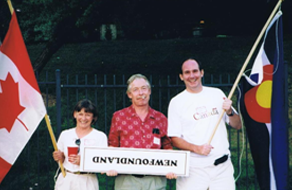 Ian Barclay, Fran Troppmann, Catherine Cano, Lloyd Brownlee and Betty Wilson worked together to make the arrangements for the 11th annual Canada Day picnic. Once again, fun times were had at the Willow Way Pool in Centennial on June 29 where 50 adults and 5 kids enjoyed the facilities and the ribs, chicken and fixin’s by Brother’s Barbecue. 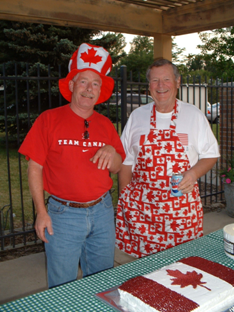 Pictured at the right are Glenn Ardley and Brock West, ready to cut the Canada Day cake made by Fran. Garth and Betty Wilson, Brock and Helen West, Al and Fran Troppmann, Don Harper, Lloyd and Geri Brownlee, and Glenn and Claire Ardley attended the celebration of Canada Day on July 1 at a reception at Penrose House in Colorado Springs at the invitation of Lt. General Ken Pennie of NORAD. The biggest event of the year was the announcement in September that Canada has re-established a Consular office in Denver. Doug Paterson is the Consul and Senior Trade Commissioner. Doug was born in Duncan, BC and educated in Peterborough, ON and Halifax, NS. He served in the Foreign Service in Dallas, TX, Mexico City, Saudi Arabia, Los Angeles, CA, Cairo, Canada and Mumbai, India. 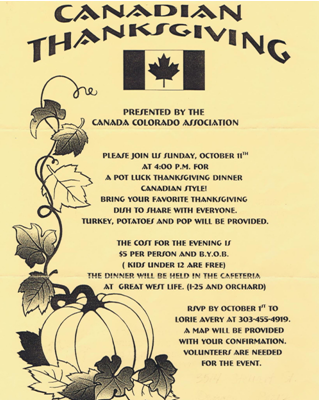 On October 12, Canadian Thanksgiving turkey dinner and trimmings were served at The Pinery Country Club to 68 people – including the new Consul. 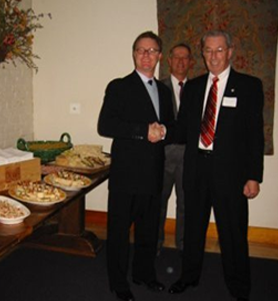 Pictured at the left, the new Consul and Senior Trade Commissioner, Doug Paterson, is being welcomed by Lloyd Brownlee at a reception held at Il Fornaio restaurant in LoDo on November 7. The event was sponsored by RBC Mortgage, PCL Construction Services and CCA. Sixty-four representatives from businesses, government agencies or interest groups with a Canadian-Colorado connection attended the event. Another rousing afternoon was held at Boston’s Gourmet Pizza during the Canadian Football playoff – Grey Cup game on November 16. Canada Colorado Association co-sponsored the International Holiday Party on December 9 at the Denver Public Library. This was a gathering of people from USA, Canada, Britain, Germany, France, Japan, Russia and Sweden to celebrate the season and our international cultures and traditions. In 2004, in January, the Denver University Library had a special section filled with French-Canadian books. Julie Caron, who was doing a bachelor degree at the University of Laval in Québec, was in Denver to open this new section. She brought books donated by the Association of Quebec Studies. Julie worked in collaboration with the Denver International School. She also had the support of CCA, the French Alliance of Denver and of the Office of Quebec Youth program. On January 18, 2004 Canada Day at the National Western Stock Show and Rodeo attracted 75 people to the dinner and 80 people to the rodeo. The Canada Colorado Association again co-sponsored the annual International Business and Rodeo Day on January 20th. Other sponsors are the World Trade Center, the Consular Corps of Colorado, Alliance Française, Asian Chamber of Commerce, British American Business Council, Chamber of the Americas, French American Business Association, German American Chamber of Commerce, Japan America Society, Netherlands-American Society, Russian-American Chamber of Commerce and Swedish American Chamber of Commerce. Friday, February 13 was a very special day this year with a visit from the Canadian Ambassador to the USA, Michael Kergin, his wife Margarita and the Consul General from Minneapolis, Christopher Thomson. A breakfast meeting was held with his Excellency, the Consul General, Denver’s Consul and Senior Trade Commissioner, Doug Paterson, CCA and executives from PCL Construction, CAE, Suncor Energy, EnCana Oil & Gas, IBI Group, Brookfield Properties and Jayman Construction. The annual steak and lobster dinner, in support of the SIDS Foundation was held on June 19 and Canada Day was recognized at the same time by the CCA group at the home of Nancy and Bruce Inglis in Greenwood Village. On July 1 several Board members attended the Canada Day garden party at Penrose House in Colorado Springs. Al Troppmann, Garth Wilson and Consul General Michael Fine with Mountie Escorts are pictured below. 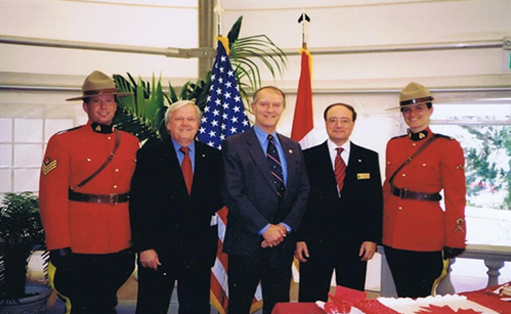 On September 29, 2004, representatives of Global Tax Network of Toronto and Denver presented Part 1 of a discussion on Taxation for Canadians living in the USA at the World Trade Center. A larger audience attended Part 2 of the series on November 17 when Ian Barclay discussed financial and estate tax planning for Canadians living in the USA. Canadian Thanksgiving dinner was served at the Denver Athletic Club this year. Fifty nine adults and ten children enjoyed the setting, salad, turkey, trimmings and pies. We were honored to have two of the new staff from the Canadian Consular office join us, Natalie Couture and Marc Boucher. On November 12 several members of the Canada Colorado Association joined a large group from the Rocky Mountain Indian Chamber of Commerce for their Gala and Award Ceremonies. CCA was a co-sponsor of the event which included native foods, a silent auction and presentations by native artists, musicians, craftspeople and dancers. The main purpose of the gathering was to award scholarships to students in pursuit of their careers. Marc Boucher, Canadian Consul for General Relations was master of ceremonies at the First Annual Indigenous Film Festival on November 19 at the Tivoli Center. Canada Colorado Association co-sponsored this event that included two Canadian films, Kanuk Family Reunion and Finding Our Talk. The CCA again co-sponsored the International Holiday party, held this year at St. Cajetan’s on the Auraria Campus. This is a social gathering of representatives from all of the international communities in the Denver area; American, British, Canadian, French, German, Italian, Japanese, Mexican, Peruvian, Romanian and Swedish. 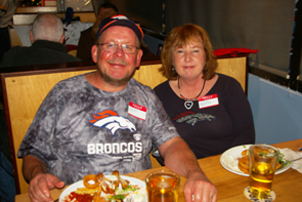 A rousing Grey Cup party was attended by 98 football fans at Boston’s Gourmet Pizza on November 21. In 2005, on January 16, sixty people enjoyed the usual tasty roast beef dinner at the National Western Club for our annual treat for the cowboys from Canada. Many of that group attended the rodeo after dinner where a select member was treated to a ride in the stagecoach. Two days later, Garth and Betty Wilson attended the International Day at the rodeo event put on by the World Trade Center where more than 110 people had an opportunity to network and enjoy more food and festivities. On May 22 the CCA held our 12th annual steak and lobster dinner – this time at the Coventry Homeowners Association Clubhouse in Littleton, courtesy of Ian Barclay. The highlight for many - particularly the hockey fans - was to have special guests Joe Sakic, David Aebischer and Derek Armstrong join the event with their spouse/significant other. 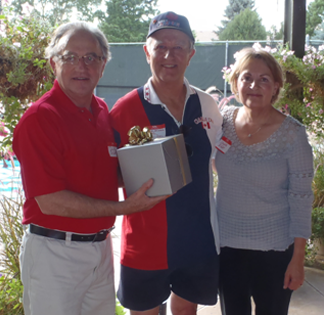 The 13th annual Canada Day picnic was held on July 2nd at the Gun Club Green Clubhouse in Denver, hosted by Garth and Betty Wilson. 55 people, including 6 children, attended the afternoon of swimming, visiting, drinking and eating. We were honored by Michael Fine, the Canadian Consul General in Denver joining us with his wife and family. Wayne Podolsky of the Consular office also came with friends Mark & Isabel Giralt from the Canadian Consular office in Mexico. 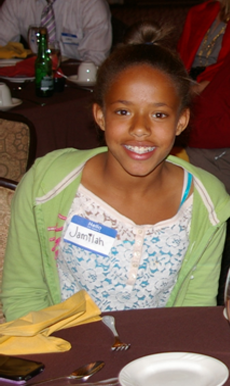 Thanks to Ian Barclay, Thanksgiving Dinner was held at the Denver Athletic Club where 49 people attended. Through some concerted effort by Lloyd Brownlee, the world famous RCMP Musical Ride performed at the National Western Arena November 10, 11 and 12 and the event was its usual fantastic show. The Grey Cup party was held at Boston Pizza and was a rousing success again this year. 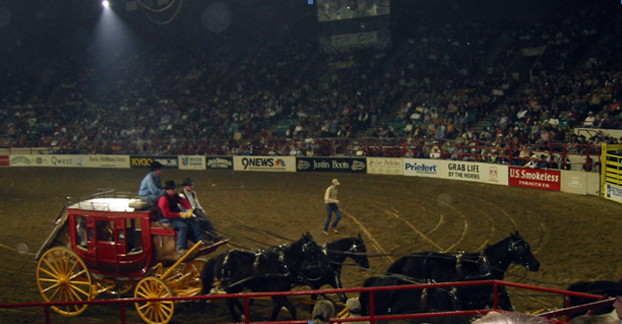 In 2006, the first event of the year was for Canada Day at the Stock Show and rodeo – co-hosted with Suncor with nearly 150 people. A skating party was organized by Wes and Tamara Cooper and held at the Denver Country Club on March 11. Wes and Alex Burney spent considerable time and effort to upgrade the CCA website and were able to get it done by year-end. The annual Steak and Lobster dinner was held on June 17 at the Al and Fran Troppmann garden. The CCA Board was again invited by NORAD to attend the annual Garden Party at Penrose House in Colorado Springs to celebrate Canada Day. A tour of the NORAD facility in Cheyenne Mountain in Colorado Springs was conducted on July 11. As always, it was a terrific experience. A dinner for Thanksgiving was not held this year. The Grey Cup Party was held on November 19 at Boston Pizza. Wally Clark-Treasurer, Garth Wilson-Past President. In 2007, January 14, 2007 was Canada Day at the National Western Stock Show & Rodeo and it was a huge success. The evening began with a reception at the Northwest Club and the traditional Roast Beef dinner followed by the World Famous Rodeo. Over 100 guests attended with the support of the Consulate General of Canada-Denver office, represented by Monica Heron, Senior Trade Commissioner, Kim O’Neil, Trade Commissioner, Agriculture as well as several staff members. Ian Barclay conducted a seminar on March 19 to discuss “Taxation of Canadians Living in the USA”. Attorney Ann Allott presented a seminar on April 19 on immigration issues. The Steak and Lobster Dinner was held on May 19 at Coventry Community Center. 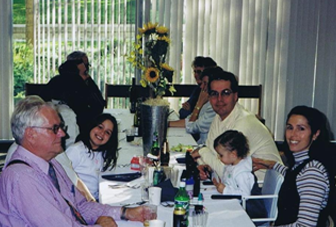 Pictured at the left are Suzie and Peter Martinek with their kids and Brock West and Ellen Thomas being served by Ian Barclay. Thanksgiving Dinner was held at Pinehurst Country Club, courtesy of Brock West, on October 14. The Grey Cup Football Party was held on November 25 at Boston Pizza. dinner and rodeo for the Canada Day at the Stock Show and Rodeo in January. The Steak and Lobster dinner was held once again at the Troppmann residence. 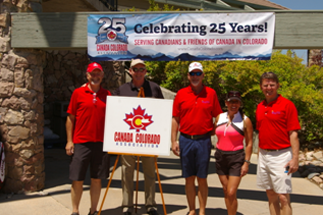 The first annual “Almost on Canada Day” Golf Tournament partnership between CCA and the Canadian Consul was started at Fossil Trace in Golden on July 2. Consul General Dale Eisler was the driving force for this event. Dale and his wife Louise are from Regina. CCA sponsored a hole-in-one prize of a car but nobody managed to win. Thanksgiving Dinner was held at Pinehurst on October 19. 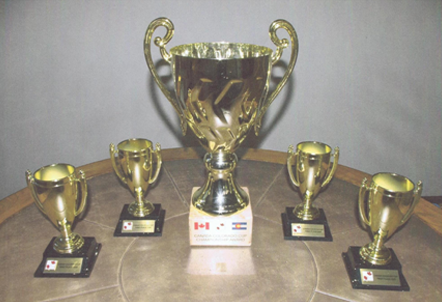 The Grey Cup party was held on November 23 at the Family Sports Center in Centennial. In 2009 January 17 was the usual Stock Show and Rodeo dinner at the National Western Complex. 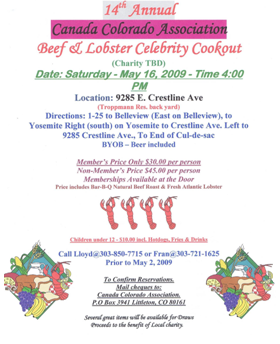 The Beef and Lobster dinner was held for over 100 persons at the Troppmann residence on May 16. Pictured below, Wes Cooper, Al & Fran Troppmann, Bob Thomas, Lloyd Brownlee, Dale Eisler, Garth Wilson and Brock West in attendance. Thanksgiving Dinner was held on October 18 at Pinehurst Country Club – hosted by Brock West. 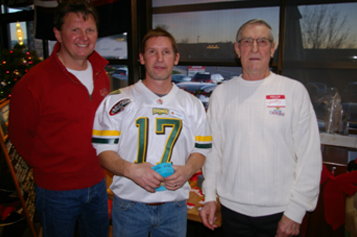 74 people enjoyed the Grey Cup party on November 29 at the Family Sports Center. On December 17 Bob and Ellen Thomas hosted a party at their home to have the Board members get to know the new Consul, Dale Eisler and his wife Louise. Wesley Cooper, Garth Wilson (part time). In 2010 CCA joined with the Canadian Consul Office for the annual Canada Day Stock Show and Rodeo event on January 17. On May 22, 71 adults and 11 kids enjoyed the Beef and Lobster dinner at Coventry Community Center, again hosted by Ian Barclay. Pinehurst Country Club put on another fantastic dinner for Thanksgiving on October 10. 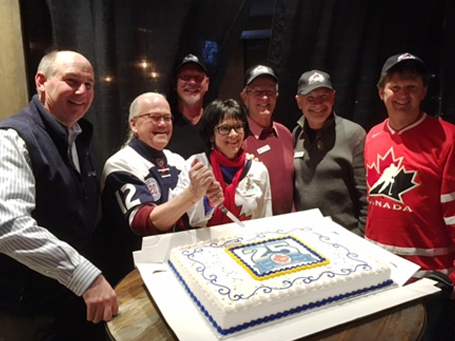 Grey Cup celebrations were held at the Avalanche Grill in the Family Sports Center on November 28. 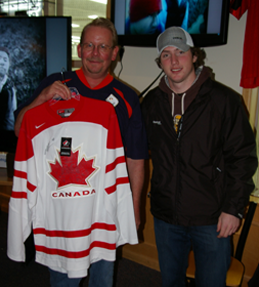 Jeff Larson won the Canada hockey jersey presented by Matt Duchene – the latest Avalanche draft choice – pictured on the right. In 2011 only 14 CCA members attended the Stock Show and Rodeo dinner on January 16 with the Canadian Consul group. 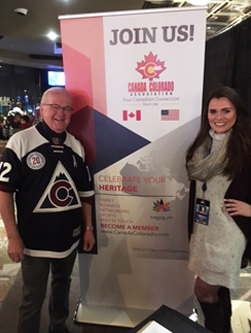 On March 12, former Montreal Canadien hockey player, Ralph Backstrom hosted 12 CCA members at a Colorado Eagles game in Loveland. The Canadian Consular office held a Canada Day event on June 30 on the 16th Street Plaza in front of the World Trade Center office tower. No Beef and Lobster dinner was held this year but a new event, Canada Colorado Family Picnic, - still with lobster - was held on August 6 at the Gun Club Green Clubhouse, courtesy of Garth and Betty Wilson. 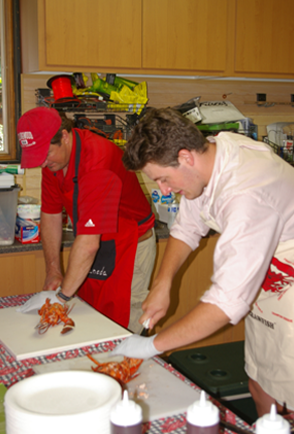 On the left are Brock West, Peter Martinek and Pierre Boisse serving the lobster. The beef and side dishes were catered by Phamous Phloyd. 65 adults and 8 children attended. At the Picnic, a farewell gift was presented to Dale and Louise Eisler in appreciation for the support of the Consular office to CCA - pictured on the right. The official reception for Dale and Louise was held at the Consul Residence on August 25.
guest speakers were Arun (Ernie) Nagratha, BBA, CA, Toronto and Jennifer Stein, EA, Chicago to discuss Global Tax Network; Nathan Carlson, MBA, AIF, QPA, QKA, President, Denver to discuss Retirement Planning; and Brian Loiseau, CPA, President, Greenwood Village to discuss Executive Planning Strategies. The presentations were made in 2 sessions, morning and afternoon, and both were to capacity crowds. Pinehurst Country Club put on its usual terrific turkey dinner with trimmings for 107 adults, 7 children and 11 kids on October 16 for Canadian Thanksgiving. A dinner at the Consul General Residence was held on October 27 for CCA Board members to meet Dr. Haverstock, President/CEO from Tourism Saskatchewan. The Grey Cup game with B.C. Lions playing Winnipeg Blue Bombers was watched at Campus Lounge by 74 fans on November 27. Wes Cooper, Garth Wilson – Treasurer. In 2012 the Stock Show and Rodeo attracted 21 CCA members in January. Another Beef and Lobster dinner was held on June 9 for 102 people. Thanksgiving at Pinehurst drew 75 people again for the usual fine spread on October 14. Marcy Grossman assumed the position of Consul General in Denver in the fall. Her husband is Michael Kofsky. They are pictured below with their family at the Grey Cup game on November 25 at the Off Broadway Lounge. 75 adults, 5 children and 2 kids enjoyed the game, the food and the prizes. Toronto beat Calgary in a great contest. In 2013 CCA had an eventful year. The Board decided not to sponsor the Stock Show and Rodeo in January because of declining interest. The major effort during the year was to study and debate whether to have CCA become a registered non-profit organization. Under the overall guidance of Pierre Boisse and with tremendous support from Ian Barclay and the Directors, steps were initiated to have that happen. The application was filed in March to become a 501c(7) Social and Recreational Club and the process was completed in March 2014. CCA co-sponsored, with the Canadian Consular Office in Denver, a Pan-Canadian Universities Alumni Networking Reception on February 21 at the Four Seasons Hotel. This was held following a Cross Border Seminar and luncheon and both were well attended in spite of a huge snowstorm during the same day. On February 23, Wes Cooper organized a family skating party at the Denver Country Club. Families and friends enjoyed the outing and the snacks. 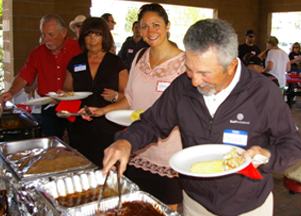 The annual Beef and Lobster Fest was held on May 18 at Spring Creek Park in Aurora, hosted by Peter Martinek and Tammy Peters. 61 adults and 10 children enjoyed the beautiful day and great food by Phamous Phloyd. Above, on the right, Bob and Ellen Thomas, Ladan Amirazizi and Frank Bilotta help themselves to food and, above on the left, are Tammy Peters, Suzie Martinek and Mindy Boisse who helped keep things running well. 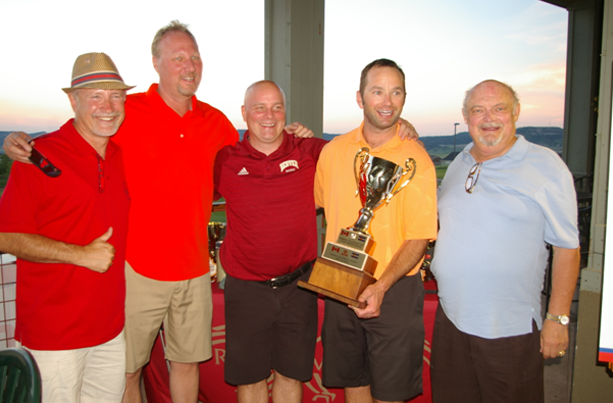 The sixth annual Almost on Canada Day Golf Classic was held at Blackstone Country Club on June 24 with another sold out event. Bob Thomas was the general host and had help from many others including Al Troppmann, Pierre Boisse, Tammy Peters, Frank Bilotta, Tracy Feist and Ian Barclay. 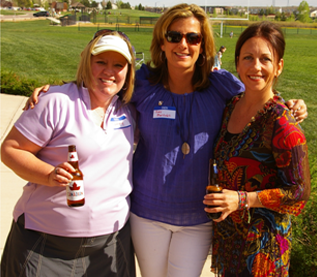 Proceeds from the tournament and auction provided a substantial contribution to the Denver Children’s Hospital Burn Unit. 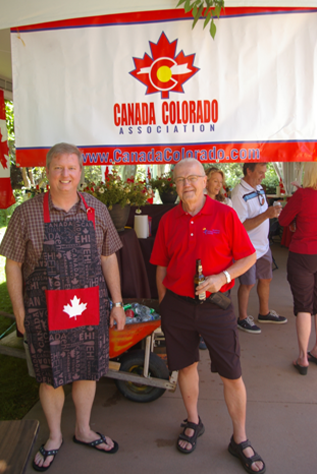 On July 1 the CCA Board members were invited to attend a Canada Day Garden Party at Penrose House in Colorado Springs. The host was Lt. General Alain Parent, the Deputy Commander, North American Aerospace Defense Command. The directors of CCA met on September 21 in Executive Session to map out a path for the Association. The all-day discussion, led by Pierre Boisse, resulted in a more concise understanding of the mission and expectations of the group. Canadian Thanksgiving was celebrated on October 20 again at Pinehurst Country Club. Brock West and the staff at the Club did their usual stellar job with turkey, ham, stuffing and trimmings – and great desserts. Tammy Peters and her daughter Jamila helped with checking in the guests. It was a great family evening to socialize. Peter Martinek, Garth Wilson – Secretary. In 2014 a monumental advancement was made with CCA. With the registration of the Association as a 501(c)7 non-profit club, formal Bylaws were adopted in April, the new logo was finalized and procedures were established to govern the various processes associated with that registration. Board Directors were given specific roles and responsibilities to streamline operations and term limits were assigned in compliance with the bylaws. In addition, the Mission Statement was updated to more closely align with the purpose of the club. Committees were established to handle membership development, member fees, website maintenance, public relations, advertising, event planning and management. A Cross-Border Business Seminar was held on May 15 with Ian Barclay, Ken Stern, Jordan Freeman and Alain Forget discussing wealth management, immigration, investments and banking issues. 50 people attended the event and it was an informative success. On June 1, 71 people (10 children) enjoyed the picnic at Spring Hollow – catered by Big Country BBQ. All who attended had a positive response but a new venue will be located for next year to suit the larger turnout. A good crowd enjoyed the Alberta singer, Gord Bamford, country music concert at the impressive Parker Arts and Culture Event Center on June 24 including several from CCA. An interview of Consul General Marcy Grossman by 9-News was part of the June 27 events on the Plaza in front of the Consular office in the World Trade Center along the downtown 16th Street Mall. 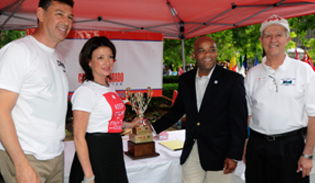 Mounties were in attendance as were several key business representatives – and Denver Mayor Michael Hancock – shown at left with Michael Kofsky, Marcy Grossman and Garth Wilson. CCA had a booth and numerous potential new members were identified. The 10th Anniversary Denver Consular office celebration was held at the Consul General Residence on June 27 with several business and government VIP’s attending. CCA was a co-sponsor of these events. On October 12, Canadian Thanksgiving dinner was served at Pinehurst Country Club for a record 146 people. Brock West was the usual standout host and everyone enjoyed the meal and the socializing. As usual, each attendee was given the opportunity to introduce their group. In late October, a questionnaire was sent to over 1,000 e-mail addresses to measure satisfaction and gather comments on how to improve the CCA services. Results were very encouraging and led to extended discussion. 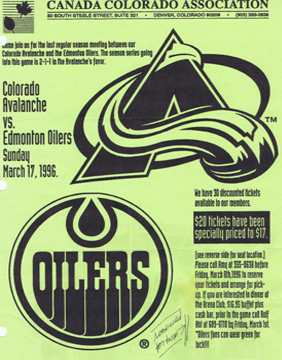 Through the combined efforts of Al Troppmann and Mike Kofsky, arrangements were made with Kronke Sports for CCA to have access to reduced pricing for seats when Canadian teams play the Avalanche. Several people took advantage of this benefit and CCA was given permission to set up a table to advertise the Association at some games. The first such event was on November 6 when the Toronto Maple Leafs were in town. A networking session in the Blue Sky Grill before the game was a huge success. On November 30, Calgary Stampeders defeated the Hamilton Tiger-Cats during the Grey Cup football game with a score of 30 to 26. 52 adults and 3 kids enjoyed the rivalry, food and drink at ‘Lil Ricci’s Pizza Place in Highland Ranch. 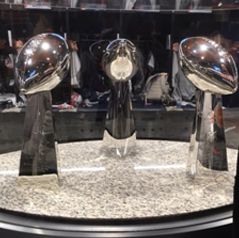 With the generosity of Denver Broncos, Al Troppmann, Garth Wilson and Peter Martinek, several great auction and raffle prizes were distributed to make the evening a great success. A social evening was held on December 12 at the Portola Club meeting room to thank the existing Directors, Committee Chairs and volunteers for their service, welcome the incoming Directors (John Manka and Joan Peterson) and award retiring Director, Brock West, with a special appreciation gift. Peter Martinek - Vice Chairman, Garth Wilson – Secretary. In 2015 the year began with a Strategic Planning Session on February 28 from 9:00 am to 4:00 pm. Lunch and snacks were provided by the PCL office and were greatly appreciated. During the session, the Mission Statement was updated, and edits to the Bylaws were approved. The website content was reviewed by Dan Taylor and steps were initiated to maintain the site. Mike Sarran reviewed the questionnaire responses, provided an interpretation of the results and guidance towards further action. Pierre presented an outline of an organizational structure for the CCA and it was discussed and refined. A decision was made to charge membership fees to belong to the Association. Mike Kofsky arranged for a block of seats at a discounted price for the Avalanche vs Senators hockey game on January 8. He also arranged for discounted pricing for the Avs vs Nashville on January 30, vs Dallas on February 14, vs Arizona on February 16, vs Flames on March 14, Oilers on March 30 and Jets on April 9. Several people took advantage of the discounted ticket prices. A Genealogy presentation was made at Kate Mullin’s Irish Pub on February 10 and a Canadian Celtic Concert with Alan Doyle was held on February 25 at Soiled Dove Underground. 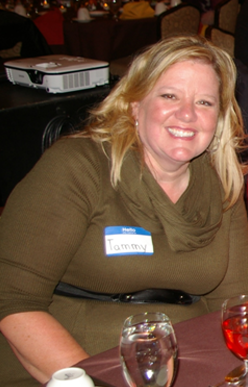 A Business Networking Event was held on March 3 at the Lowry Beer Garden and was very well attended. Two tickets to the Avs vs Flames game on March 14 were awarded as a raffle prize. 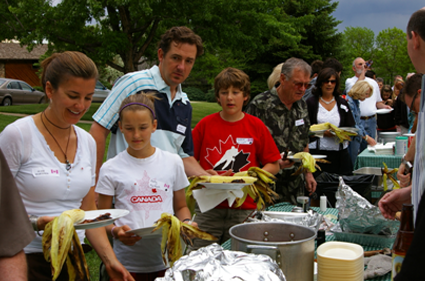 The beef and lobster picnic was held on June 7 at deKoevend Park in Centennial. 96 people attended (12 kids) and had a great time. A golf bag from Royal Bank of Canada was won as a raffle prize by Patti Dagg. 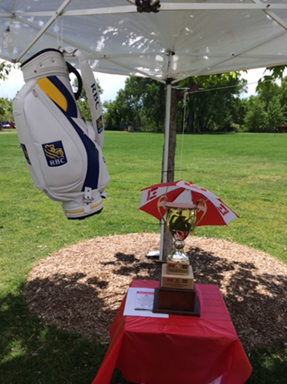 The CCA golf trophy was on display to promote an enthusiastic turnout for the tournament scheduled for later in the month. 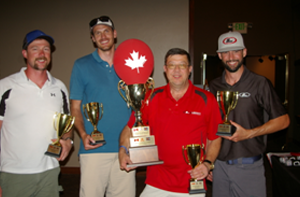 Another terrific “Almost on Canada Day Golf Classic” was held on June 29 – this time at Red Hawk Ridge Golf Course in Castle Rock. 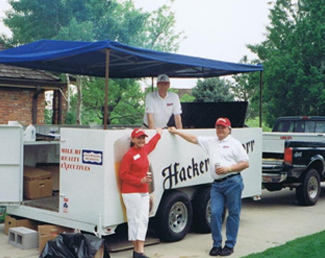 John Manka was the event chair and was assisted by Al and Fran Troppmann, Tracey Feist, Rob Mancey and Joan Peterson. For Canada’s 148th birthday, Canadian Consul General in Denver, Marcy Grossman, hosted a cocktail reception on June 30 at North County Restaurant in the Lowry neighborhood. The evening was co-sponsored by Royal Bank of Canada (RBC). During the July Board meeting, the Directors approved a motion to sponsor a Canada Colorado team for the NORAD Canadian Hockey League. CCA purchased new jerseys for the players and John Manka is our enthusiastic representative on the team. An informal business networking gathering was held on August 11 at Valley Country Club in Aurora to provide networking opportunities with the South Metro Chamber of Commerce. 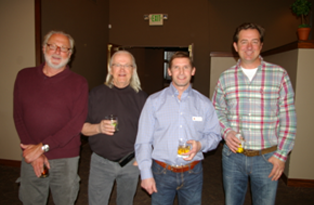 The event was sponsored by the CPA firm Holben-Hay-Lake-Balzer who arranged for tasty appetizers and drinks. Through the efforts and connections of Joan Peterson, CCA was extended an invitation to welcome Canadian Military families at a picnic on August 22 at the Air Force Academy. On September 10, another informal business networking event was held at Alliance Francais de Denver. Finger food, wine and beer were provided by Bob McCarroll. Several CCA Board members and Directors attended. Anadarko Petroleum made three presentations in September and October to discuss “The Facts on Fracking: What’s at Stake for Colorado”. Each presentation was well attended. The University of Calgary, Alberta hockey team played the Denver University Pioneers during the weekend of October 3 and 4. CCA arranged for reduced ticket prices and held a reception on Sunday during the game. Eight members of the DU Pioneers are from Canada – BC, Alberta and Manitoba. 87 adults, 3 children and 9 infants attended the Canadian Thanksgiving dinner at Pinehurst Country Club on October 18. The usual memorable turkey dinner with all the trimmings was enjoyed by everyone – along with the opportunity to visit with old and new friends. A photo album of all who attended is shown on the Canada Colorado Association website; www.canadacolorado.com. Garth and Betty Wilson hosted this year’s event with the help of Barry Kemble and other volunteers. Brock West was awarded a life membership and plaque by Chairman Pierre Boisse in recognition for Brock’s long and valuable service on the CCA Board. The photo to the right shows Brock West accepting a lifetime membership award plaque from Pierre Boisse. 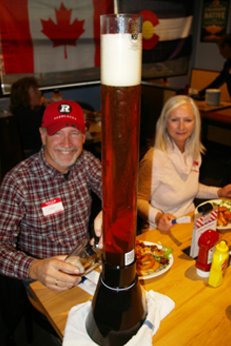 54 adults and 6 kids cheered for the Ottawa Red-Blacks or the Edmonton Oilers at Jackson’s All-American Sports Grill on November 29, 2015 in celebration of the 103rd annual Grey Cup game. The score bounced back and forth through the game and Edmonton prevailed 26 to 20 at the end. Plenty of beer and drinks were consumed along with chicken nuggets, pizza, salad and appetizers. The picture at the left shows Garth imbibing to celebrate the Grey Cup festivities. Garth and Betty Wilson were hosts for the event and, through the generosity of Fred Fleming of the Denver Broncos and Brian Hart of Frame de Art as well as the volunteer services of Tracey Feist, Al Troppmann and Peter Martinek of CCA, there were plenty of raffle and auction items for distribution. During the last meeting of the Board in 2015, several nominees were approved for service as Directors in the coming years. Announcement of the new Board makeup will be made in early 2016. A Christmas party for 126 CCA members and friends was held at the Pepsi Center during the Av’s/Toronto hockey game on December 21. Unfortunately, due to problems with the catering firm, the service and food was less than satisfactory. Kronke Sports representatives have promised to rectify the situation for future events. John Manka, Garth Wilson – Secretary. 2016 activities started off on January 21 with International Business Circle gathering at the CSU Denver Center – sponsored by CCA, Colorado State University and Royal Bank of Canada. Drinks, appetizers and interactive discussions on the World Business Climates were enjoyed by a large crowd – including Pierre Boisse, Rob Mancey, Dan Spancers and Garth Wilson from CCA. The annual Executive Session with the Directors of CCA was held on January 23 at Plum Creek Country Club. This all-day program reviewed past accomplishments, outlined future plans and introduced new Directors to the operation of the Association. The new Directors were Rob Mancey, Dan Spancers, Darcy Tieulie and Maren Wood. Mike Sarran was the facilitator to keep the program focused. Pictured at the right are Chairman Pierre Boisse, Directors Al Troppmann and Darcy Tieulie and Vice Chair Peter Martinek. On March 6, courtesy of Al Troppmann, many of the Board Directors and spouses attended the “Av’s Better Halves” charity brunch at the Hyatt DTC. The meal was served by the players and a fashion show followed with the team members escorting a group of special kids. Al had arranged to have the CCA logo prominently displayed in the program booklet, thereby providing excellent promotion for the group. Maren organized a networking session at the Lowry Beer Garden on March 15 where several current and new CCA folks mingled and exchanged opportunities to work together. After that gathering, Garth and Betty Wilson and Rob Mancey went to Frame de Art studio on South Broadway. Owners Brian and Shelly (from Cranbrook, BC) Hart were observing 25 years in business and have made several donations to CCA. The gallery was jamb-packed with art lovers, Bronco fans, and the Bronco mascot and cheerleaders to enjoy the snacks, drinks and door prizes. On May 30, CCA supported a reception arranged by the Denver Canadian Consular office to host the Right Honorable Governor General David Johnston at the Four Seasons Hotel. A crowd of about 400 people enjoyed drinks and snacks while listening to His Excellency express his appreciation for the service of the Consular staff, the supporters of Canada in Colorado and the military cooperation between the countries. Matt Duchene presented him with an Avalanche hockey jersey. 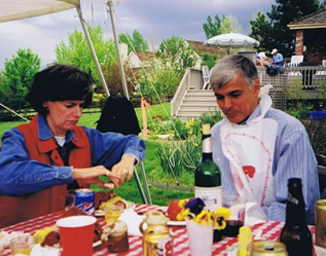 The annual Beef and Lobster picnic was held on June 12 at the Troppmann residence. 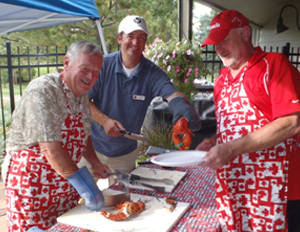 Host Al Troppmann watched Mike Saran cook the lobsters while Committee Chairman, Peter Martinek and son Andrew were master carvers of the lobsters and beef brisket. 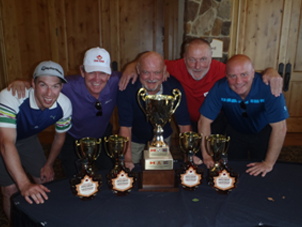 The annual Charity Golf Tournament was held on June 27 at Plum Creek Country Club in Castle Rock under the able guidance of Chairman John Manka and volunteers Ian Barclay, Dan and Nina Spancers and Rob Mancey. The trophy winners were: Cody Clickner; Blane Thingelstad; Ryan Frey and Tom Riebel with a scorching round of 62! Several Directors attended the 149th Birthday of Canada festivities with NORAD at Penrose House in Colorado Springs on June 30. On the same day, a reception, co-sponsored by CCA, was held at the Governor’s Mansion garden in Denver to wish Consul General Marcy Grossman and family safe travels and good wishes at her new posting in Ottawa. On July 9, several Directors attended the 971 Wing party at the home of Joan and Jim Peterson near Colorado Springs. A festive and fulfilling afternoon was enjoyed with old and new friends from the group. Our 25th Anniversary celebration was held on October 16 at Pinehurst Country Club in conjunction with the annual Canadian Thanksgiving dinner. 74 adults and 12 children (plus 2 infants) enjoyed an evening of good food and fun reminiscing. Through the generosity of Dan Spancers we enjoyed pleasant music by the French Toast Three with Joe Gilmore. Garth Wilson was the host and MC this year to review the accomplishments, thank past and current Board Directors and sponsors. Chairman Al Troppmann welcomed the guests and introduced the new Consul General, Stephane Lessard. The CG spoke about his role and expectations. IBI Group sponsored a table and Sal Birritteri made a presentation describing the firm’s expertise. Pierre Boisse offered a special Canadian blessing in English and French. A slide show of the 25-year events and people was shown during dinner. 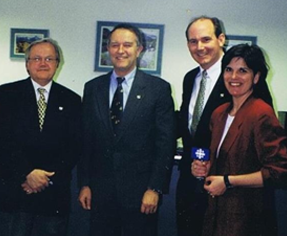 Pictured at the left are those Directors who attended: Maren Wood, Pierre Boisse, Stephane Lessard, Dan Spancers, Joan Peterson, John Manka, Al Troppmann, Peter Martinek and Garth Wilson. Hambrook at the right with his wife, Connie. Darcy Tieulie and his Mom, Paulette, and Dad, Gerry were master hosts with assistance from Rob Mancey for the Grey Cup Party on November 27 at Jackson’s All American Sports Grill. The food and drink was plentiful for the group of 55. Auction items included hockey and basketball tickets, autographed footballs and lacrosse jersey, an autographed Bronco poster and Canadian hockey jerseys. In addition, many great raffle prizes were awarded. Toronto won a nail-biter over Edmonton. 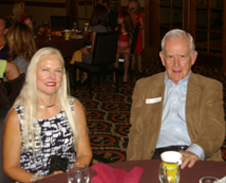 (above) – Jeff Larson and Kathy Avery (newly nominated for a Directorship) enjoyed the food and drink. 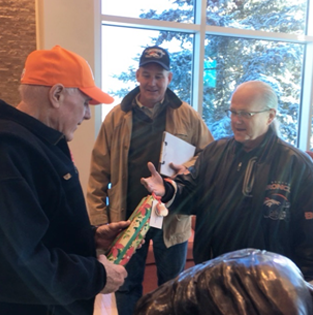 Through the efforts of Ian Barclay, Fred Fleming of the Denver Broncos was tour guide for 25 CCA members and friends on December 17 to see the inner workings of the Bronco Training Facility. Fred showed the group the media/meeting area, locker room, cafeteria, training facility, workout room and the indoor practice arena. On December 22, Family Night at the Pepsi Center was held as the final CCA event of our 25th anniversary year - 2016. Al Troppmann and Kayle Ertle put together a marvelous evening of socializing, buffet meal, door and raffle prizes and an Av’s vs Maple Leaf hockey game. 111 people came for the dinner and an additional 32 came for the game only. Unfortunately, the Av’s forgot to bring their game face – losing badly to Toronto. 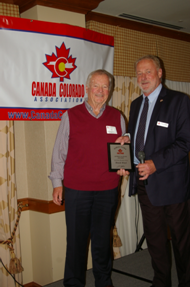 This brings to an end a summary of the first 25 years of the Canada Colorado Association. Although we tried to include the names of all those who have been a part of the success of our group, we may have missed a few – for which the author asks forgiveness. 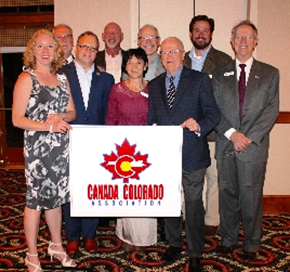 It is obvious that many people have participated in the life of the Association – donating untold hours and great efforts to bring the Canadians in Colorado together for social and business events. We thank the many sponsors and donors who generously gave assistance and gifts to make the occasions interesting for our participants. Mostly, however, we thank the members who have shown that there has been a burning desire to bring people together for those events. It has been a pleasure helping where we were able.